Montreal is just north of the border for go players in New York, Vermont, and New Hampshire. They have a thriving go community and a full time place to play go and enjoy some quality tea, baked goods, soups, and sandwiches at Senthe Tea House located at 6547 Saint-Hubert. They also hosted the 41st Canadian Open at College Jean-de-Brebeuf in early September. I often play in their tournaments; Americans are warmly welcomed! But I recently discovered an interesting place to play go that the folks in Montreal might not even be aware of. 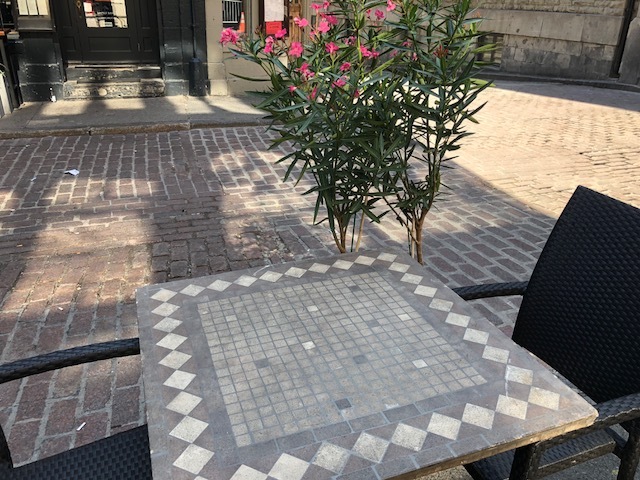 While walking around Old Montreal I found a restaurant, The Keg Steak House and Bar, located at the corner of Saint Paul and Saint Jean-Baptiste that has an outdoor terrace with chairs and tables with full-sized go boards inscribed on them! This is probably unknown to the proprietors as well.